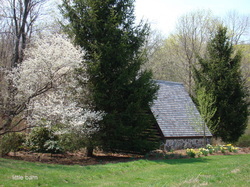 The buildings are set in approximately 5.3 very private, bucolic acres. The whole area is very historic with many old Quaker homes lining the quiet, country roads and the Old Quaker Meeting House right nearby. The buildings are placed on the far side of the property so the path down the winding drive gives a very nice chance to see them as you enter the property. All utilities are underground so there is nothing to spoil the 18th Century atmosphere. All the gardens were designed by the owners. 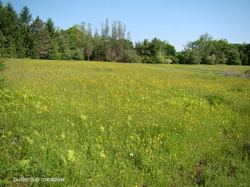 It has been the intention of the owners to leave most of the fields in their natural state. The west field is a mass of buttercups in the early summer that seem to morph into fireflies at night, and a favorite place for the soaring hawks of the hill. 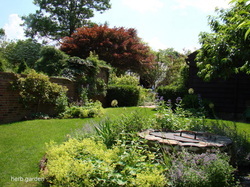 The owners have reconstructed what was a farm pond that is now surrounded by woods and is a veritable "secret garden" with many natural plants being encouraged as well as exotic and unusual plants, shrubs and trees being added. The ancient apple trees that a long ago farmer planted still provide this area with a beautiful spring umbrella of blossoms. The owners are lovers of trees so that all around the house have been planted many different species of trees, many of which have greatly matured over the twenty plus years the current owners have had the property. 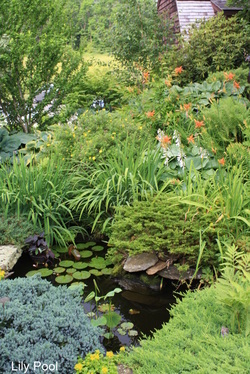 The bulk of the gardens are in near proximity to the structures, mainly in the central brick courtyard which is separated into different levels by low stone walls and which has three lily pools, two of which are connected by a small stream. 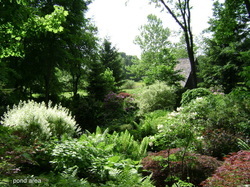 Also there is a white garden, traditional perennial garden and shade gardens with beautiful specimen trees. 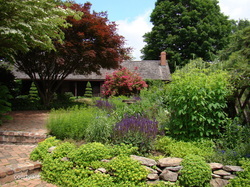 There is an herb garden and small dwarf orchard to the side of the house that includes a buried cistern capped by a reproduction stone well which captures the rain water from the house roof and stores it. From there, there is also a buried underground water line that allows this water to be used for the vegetable garden which is on the otherside of the pool. The pool area is a special place. 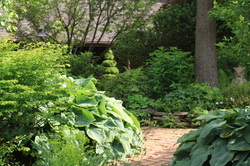 Although only a few feet away from the house, it is hidden by verdure so cannot be seen from the house. It has a freeform gunite pool, stone capped and heated. There are natural plantings around it and, to satisfy zoning requirements, a brick wall, with curves and pierced with a chippendale fence. The lounge area here is stone and close to the gazebo and courtyard. The screened in gazebo was designed with the owners' love for steep roof lines in mind and the roof interior in the eating part of it is lined with old roofers to keep in the 18th Century tradition, with the brick courtyard continuing in as its floor There are two iron chandeliers for lighting with electric and music wired from the house. The entire property is surrounded by camouflaged deer fence so all the hard work and mature plantings will not be destroyed by the four-footed natives. 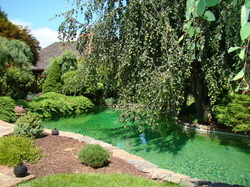 As can be imagined, the property is a favorite of the many garden tours which have visited it over the years.